Holler Media (hmedia) is a locally based video production company delivering high quality 90-second marketing videos which can be uploaded onto your website or Facebook to showcase your company services and products. Web based marketing, training, instructional or special event videos are excellent ways to promote your businesses. Marketing research notes people are more inclined to watch a promotional video before they read text or browse pictures when visiting your website. Using the most up-to-date equipment (4K cameras to quadcopter drones), Steve will carefully listen to your needs and then produce an exciting video product you will be proud to have represent your company. Affordable, local, and very committed to helping grow your business – contact Steve and learn how easily you can improve your marketing presence! 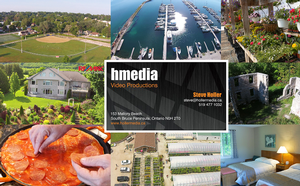 Visit www.hollermedia.ca today to see example videos!